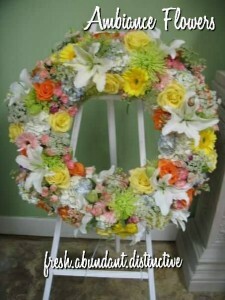 This lush wreath is a vision of a beautiful garden. 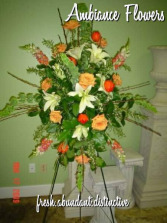 Let AMBIANCE FLOWERS FOR ALL OCCASIONS deliver a lovely floral expression of sympathy and reverence for you. This arrangement features white roses, Fuji mums, gladiolus, lilies and bells of Ireland.